Store owners on Covert Avenue in New Hyde Park want shoppers to keep in mind that they’re still open for business despite a partial road closure. On Monday, a section of Covert Avenue between 1st and 5th avenues was closed for approximately six months to accommodate a grade crossing elimination. 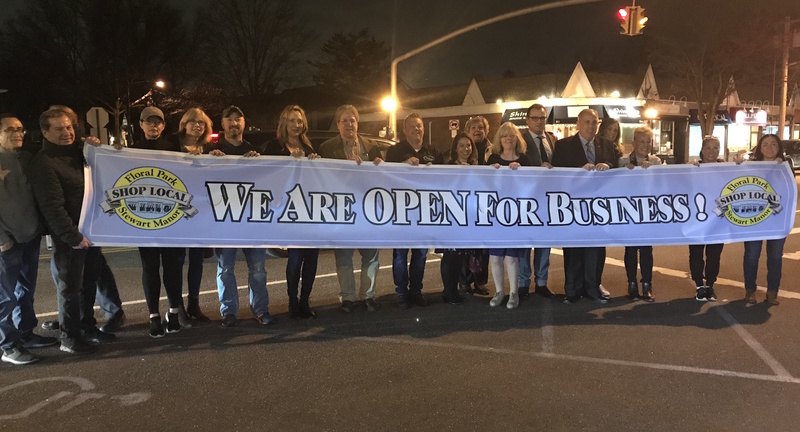 Last Thursday, Covert Avenue business owners met with representatives from the MTA to discuss the best ways to promote their businesses despite the impact of the road closure. Paul Copoziello, the owner of the restaurant Capo in Floral Park, said that Covert Avenue business owners are nervous about what to expect from the construction in regard to signs and detours. He said one of the main problems is that the original signs identified Covert Avenue as being closed when that is not exactly the case. Some of the ideas to inform shoppers that the businesses are still open are hanging a banner that reads “We Are Open For Business!” and “SHOP LOCAL, Floral Park and Stewart Manor” and creating a flyer to clarify that the road is only partly closed and explaining the detours, as well as an advertising campaign. An MTA spokesperson said representatives and the business owners are currently deliberating where the best location for the banner is. The MTA is also hosting an “Open for Business” website to inform shoppers of the open or closed status of local businesses. The companies currently listed on the site include Covert Optical, Jo-Mar Grooming + Boarding, k.hunter boutique and McGreevy Hair Studio in Floral Park and Body Works Day Spa, Carvel and Giuffre Law Offices in New Hyde Park. All businesses are listed as open. Copoziello said it has brought him some relief that the MTA representatives have been meeting with business owners and showing interest in helping to alleviate some of the closure’s impact. He said that he appreciates the open communication that Leslie Mennick, an LIRR consultant from the Calladium Group, and Travis Brennan, the director of community outreach for 3rd Track Constructors, have facilitated. Floral Park Mayor Dominick A. Longobardi, in a mass email regarding the closure, urged residents to make a special effort to patronize the village’s businesses, shops and restaurants during the closure period. To detour around the closure, traffic coming from either direction will be directed to use Jericho Turnpike, Tulip Avenue, Covert Avenue (south of 10th Avenue), Stewart Avenue and New Hyde Park Road. Commercial vehicles approaching the closure will detour using Jericho Turnpike, Tulip Avenue and New Hyde Park Road. The Covert Avenue grade crossing is one of seven that are to be eliminated as part of the LIRR Expansion Project. The crossing will be rebuilt as a two-way underpass with a sidewalk on its eastern side. “This temporary road closure will enable us to reopen the safer, reconfigured roadway in just a matter of months,” Janno Lieber, the chief development officer of the MTA, said in a statement. The project, which will result in the addition of a third track between Floral Park and Hicksville, is expected to be completed in 2022. The third track will presumably reduce congestion and delays along the train line and will enable “true bi-directional service” during peak hours for the first time in Long Island Rail Road history, according to a news release. According to the MTA release, trains will no longer need to blast their horns and crossing gate bells will become unnecessary, which will reduce noise. MTA officials assert that the crossing gates are down 50 percent of the time during rush hours.